CC Kat is a leading Midlands plastic surgeon specialising in cosmetic and reconstructive surgery. One of the very few female plastic surgeons in the UK, she is in a unique position to offer that professional female perspective and care. As a perfectionist, she believes in achieving the best possible result for every patient. In April 2012, Birmingham Post named Mrs Kat one of the top Plastic surgeons in the UK, working in Birmingham's Edgbaston Medical Quarter (EMQ), one of Europe's premier medical, research and healthcare districts. In April 2013, Mrs Kat was named in The Times by Dr Mark Porter MBE as one of the top Cosmetic surgeons in the UK. Dr Porter is the medical correspondent at The Times, doctor on The One Show and presenter of Radio 4′s flagship medical series Inside Health. He is a familiar face to millions and one of the most experienced media medics in the UK. in March 2014, CC Kat was listed by Tatler Magazine as one of UK's top 5 facial cosmetic surgeons, featuring her 'one stitch/two stitch mini facelift'. In April 2017 and again in April 2018, Tatler Magazine featured her as one of UK's top body contouring plastic surgeons, highlighting her 'lock and glue lipoabdominoplasty'. She is a member of the British Association of Aesthetic Plastic Surgeons (BAAPS), the British Association of Plastic, Reconstructive and Aesthetic Surgeons (BAPRAS), the International Society of Aesthetic Plastic Surgeons (ISAPS) and the European Association of Societies of Aesthetic Plastic Surgery (EASAPS). CC Kat is also an international member of the American Society of Plastic Surgeons (ASPS) . She is on the General Medical Council (GMC) Specialist Register for Plastic Surgery and a member of the Medical Womens Federation. CC Kat has a strong regional profile, having been chosen to appear on regional TV news programme Central News for its International Women's Week special as well as its regional news Midlands Today. Leading local health and beauty magazine, Body Beautiful, regional lifestyle magazine City Living and Midlands radio station, Kerrang, have also featured her. National media coverage includes The Times Magazine, which featured two of her patients for a positive portrayal of patients post cosmetic surgery. Coverage of her breast reconstruction work has also appeared in national broadsheet newspapers including The Independent and The Guardian. CC Kat graduated from the National University of Singapore Medical School in 1987. Further training ensued which culminated in her 6 year specialist training in Plastic Surgery at Mount Vernon Hospital in London, Queen Mary University Hospital in Roehampton and Stoke Mandeville Hospital in Aylesbury. Fellowships at hospitals including the renowned Wellington Hospital in London saw her gain experience in endoscopic brow lifts, facelifts, eyelid surgery, rhinoplasties and body contouring procedures including abdominoplasties and liposuction. Her final fellowship covered all aspects of breast reconstructive surgery and was undertaken at the regional breast centre based at the University Hospital of South Manchester and the plastic and reconstructive unit at the world renowned EmoryUniversity Hospital in Atlanta, USA. 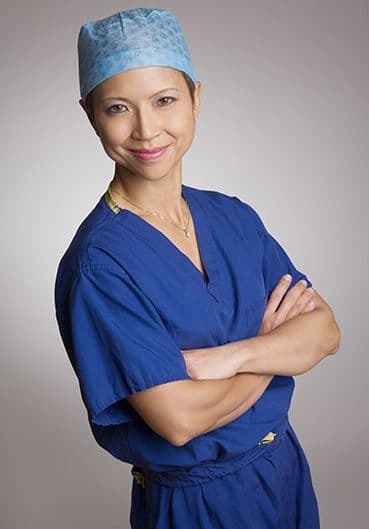 She was appointed as a Consultant Plastic and Reconstructive Surgeon at the University Hospital of Birmingham in October 2000, with a general plastic and breast interest. In April 2003, her NHS breast surgery work led her to develop a similar service at the Heart of England NHS Foundation Trust. In October 2010, Mrs Kat stopped her NHS commitments to dedicate herself full time to her Birmingham Skin, Laser and Cosmetic Surgery Clinic.